The Temple: Panchavarnaswamy Temple is located in Woraiyur, a suburb of Tiruchirapalli,Tamil Nadu. Panchavarnaswamy is a Paadal Petra Sthalam revered in the the Tevaram, written by Tamil saint poets Nayanars. As per legends, Shiva is believed to have appeared for sage Udanga in Pancha varnam (five different colours),hence the deity is called as Panchavarneswarar. The temple is also called as "Tirumukeechwaram".The temple is believed to have been worshipped by Garuda. 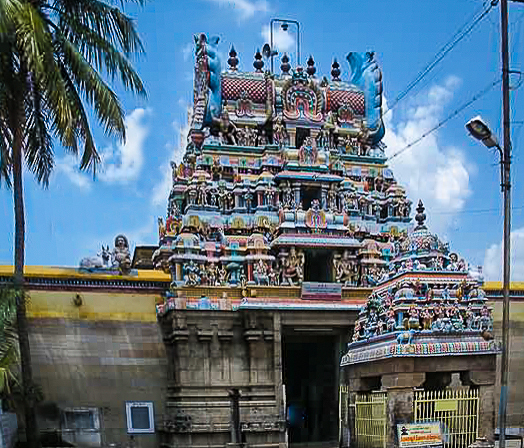 The temple complex has three prakarams and a five-tiered rajagopuram . The central shrine of the moolavar Panchavarnaswamy (Shiva) in the form of lingam faces east . The idols of the deities Ganesha , Subramanya , Nandi and the Navagraha are located in the mandapam (hall) leading to the sanctum. The the walls around the sanctum of Panchavarnaswamy has images of Dakshinamurthy , Durga and Chandikeswarar. Important Festivals: Six poojas are performed in a day at the sanctum sanctorum. There are weekly pooja rituals like somavara pooja (Monday) and sukravara pooja (Friday), fortnightly pradoshams and monthly festivals like amavasai (new moon day), kiruthigai, pournami (full moon day) and Chathurthi. Temple location The temple is in Woraiyur 10 kms from Trichy Central. Temple Timings The temple is open from 5:30 a.m. to 12:30 p.m. and from 4.00 p.m. to 8.00 p.m.
How to reach? This is well connected by many local town buses,auto rickhaws and taxi cabs. Where to Stay? There are many good hotels at all budgets in Trichy. Other notable temples nearby Nachiar Koil Azhagiya Manavala Perumal Temple is one of the 108 vaishnavite divya desams,the beautiful rock fort Uchipillayar and Thayumanavar temple,SriRangam Ranganathan Temple Thirukkarambanoor in UthamarKoil ,another one of the 108 divya desams are in the near vicinity of within 10 kms.